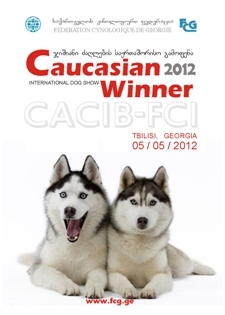 International All Breeds Dog Show CAC-CACIB FCI "Caucasian Winner 2012" took place on 5 May 2012 in Tbilisi, Georgia. The show was organized by the Fédération Cynologique de Géorgie (FCG). Ring Judges: FCI Experts Mr. Igor Selimovich (Croatia) and Mrs. Tatyana Shyjan (Ukraine).